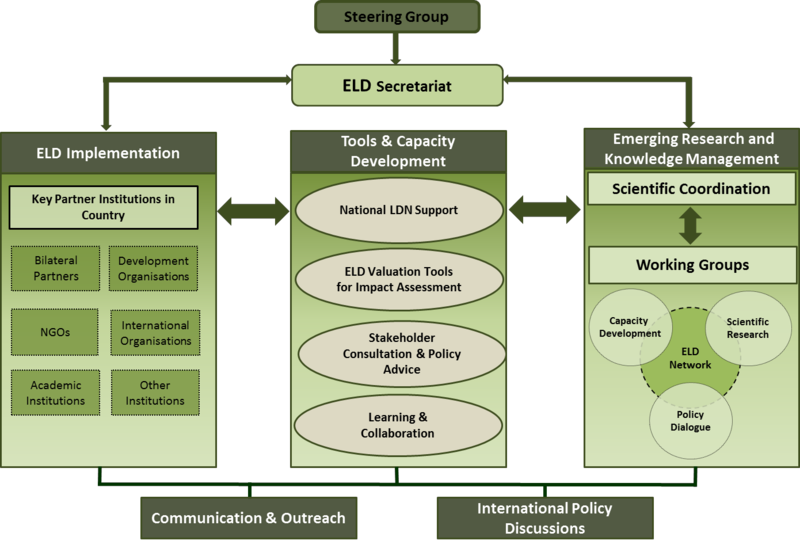 The Economics of Land Degradation (ELD) Initiative is an initiative on the economic benefits of land and land based ecosystems. The initiative highlights the value of sustainable land management and provides a global approach for analysis of the economics of land degradation. It aims to make economics of land degradation an integral part of policy strategies and decision making by increasing the political and public awareness of the costs and benefits of land and land-based ecosystems. The partners’ vision of Economics of Land Degradation (ELD) Initiative is to transform global understanding of the value of land and create awareness of the economic case for sustainable land management that prevents loss of natural capital, secures livelihoods, preserves ecosystem services, combats climate change, and addresses food, energy, and water security, and to create capacity for the utilisation of economic information for sustainable land management. We mainstream the full benefits of land in international and national land use strategies and action programmes by proposing effective solutions, tailored to country- or region-specific needs, including policies, and activities to reduce land degradation, mitigate climate change and the loss of biodiversity, and deliver food, energy, and water security worldwide.